Observe, Classify, Compare, Use Numbers, Predict, Measure, Sequence, Collect Evidence, Experiment, Control/Test Situations. Across grade and ability levels, GreenMount students learn fundamental science skills through an inquiry-based program. The following grade-appropriate entries are drawn from text materials provided by McGraw-Hill Science for grades 1-4 and Science Plus by Holt, Rinehart and Winston for grades 5-8. Supplemental materials, texts, and resources are also used to enhance student learning. 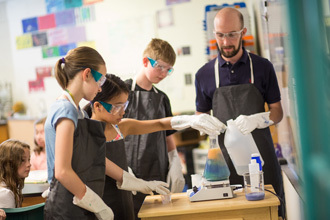 The topics and skills correlate to National Science Education Standards from the National Research Council, with content areas divided into three subcategories: Life Sciences, Earth Sciences, and Physical Sciences. When possible, units are chosen to match with the GreenMount Theme Studies program. By grade 8, students will have experience in biology, zoology, botany, anatomy, oceanography, genetics, chemistry, physics, astronomy, ecology, geology, meteorology, archaeology, and petrology.